On the one hand, this film admirably portrays the life of a native american. On the other hand, it is highly problematic. There are some decent acting performances, but the score is tedious Hollywood pap. The script is the biggest problem. First of all, it is not very historically accurate, sacrificing facts to develop melodramatic plot points. But the worst thing about it is that the story is designed to emphasize personal failings to diminish the nagging problem of racism. Now, the film does address racism. But it is brought up mainly as a “strawman” to be knocked down in favor of a formulaic personal struggle narrative arc. 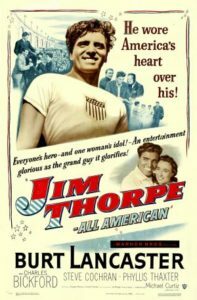 It presents Thorpe’s life as one of him being too emotionally weak to succeed (in the face of racism, personal tragedies). To draw an analogy, this is premised on the Louis Armstrong model — a great individual can overcome all institutional and social obstacles (racism) just by being personally talented enough in ways that are non-threatening to social power structures. This is essentially a parallel of the “Talented Tenth” theory of W.E.B. Du Bois (later disavowed) and the questionable advocacy of Booker T. Washington. In other words, without any irony, Thorpe is merely expected to have a superhuman willpower and resolve to overcome discrimination. The real-life Jim Thorpe was subject to a level of discrimination well beyond anything depicted in the film, and the film would have been much better if it addressed that (and had a better score). For that matter, one would hardly realize from the film that its timeline runs through the Great Depression. Anyway, fortunately in the coming years there were other, sounder ways of looking at these sorts of questions gaining traction (see Frantz Fanon, Paulo Freire, etc.). A comedic sports biopic that is a bit too corny and hamfisted to really succeed. It is loosely (very loosely) based on the story of real-life ski jumper Michael “Eddie the Eagle” Edwards, who was one of the most inspiring figures of the modern olympic games. Emma Goldman is credited with saying, “If voting changed anything, they’d make it illegal.” The story of Eddie the Eagle and the Jamaican bobsled team (both competed in the 1988 winter olympics) are kind of the sports corollary to that saying. Their presence resulted in rule changes to ban almost any others from following in their footsteps. If there was hope for anything good in the olympics, it was (and is) in athletes like Edwards, who came from a working class background and self-funded his training. Sadly, the olympics are a bastion of corruption — from the U.S. government pulling the term “olympics” out of the public domain (privatizing the commons), to out-of-control corporate sponsorships/bribery/consumerism, to bribes and scandals with the top committees, to financial chicanery and defrauding of public budgets for funding, to wasteful construction, … ahh, the list goes on. They might represent everything wrong with sports — though there are so many examples of dirty business in sports that there are many other contenders (FIFA, NFL, NCAA, etc., etc.!). The world would be a better place without them all, frankly. I still remember the real-life Eddie the Eagle jumping in the olympics. I was in a bar or restaurant of some sort with my family. Everyone in the place watched the TV to see Eddie the Eagle jump. 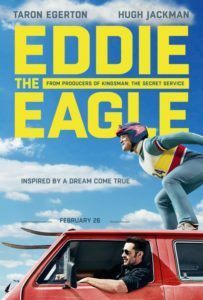 Anyway, this film is dumb but the story of the real-life Eddie the Eagle remains a great thumb in the eye of elitist twats who run the world (for now). But how long with it take to disqualify Chris Froome and revoke his titles for doping? Too long, it seems.